Zimbabwe formally ends local dollar currency. 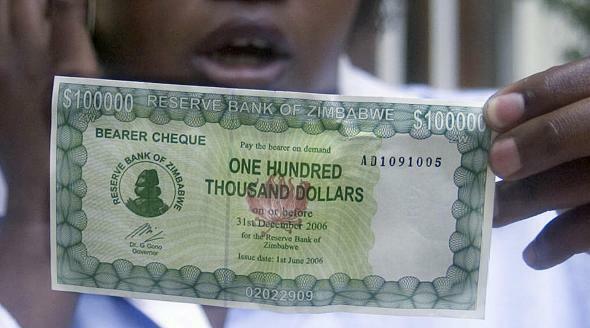 A Zimbabwean woman displays the new $100,000 Zimbabwean dollar bill. After a brutal decade-plus, the Zimbabwean dollar is being put to rest. The country’s central bank on Thursday announced as of Monday, June 15th the country will be dropping the local currency, which through severe economic mismanagement under President Robert Mugabe had not only become unusable, but a global punch line. The exchange program set up by the central bank for holders of the local currency shows how far the beleaguered Zim dollar has fallen. For anything up to 175 quadrillion Zimbabwean dollars the bank will offer $5 in return. After that $1 will be paid for every 35 quadrillion Zimbabwean dollars. Bills printed before 2009 are slightly more valuable and can be exchanged at a rate of $1 to 250 trillion Zimbabwe dollars. The spiraling hyperinflation of the 2000’s pushed the country to effectively abandon the local currency in 2009 for state business. Harare began using a basket of currencies, including the U.S. dollar and the South African rand, to curb inflation and restore faith in the banking system. The recent move by the government will bring day-to-day monetary transactions into the same multi-currency system. At its lowest point in 2009, hyperinflation had so decimated the currency that the largest denomination note was a whopping $100 trillion. It was not enough for bus fare at the time. Inflation during that period topped out at 500 billion percent. “At the height of Zimbabwe’s economic crisis in 2008, Zimbabweans had to carry plastic bags bulging with bank notes to buy basic goods like bread and milk,” Reuters notes.